Step up to the plate with the Pawn Stars when a Bible that belonged to Mickey Mantle throws Corey a curveball. Believed to be from a rehab visit, will the Bible be a revelation or make a quick exodus out of the shop? Then, Rick is intrigued when a customer brings in a pen President Lyndon B. Johnson used to sign Medicare into law. Will he sign on the dotted line or will the price be too painful? 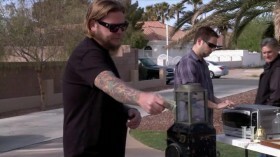 And later, the guys start a competition that tests their buying skills. Can Rick become the biggest dealmaker in the shop or will Corey and Chumlee turn him into a sore loser?